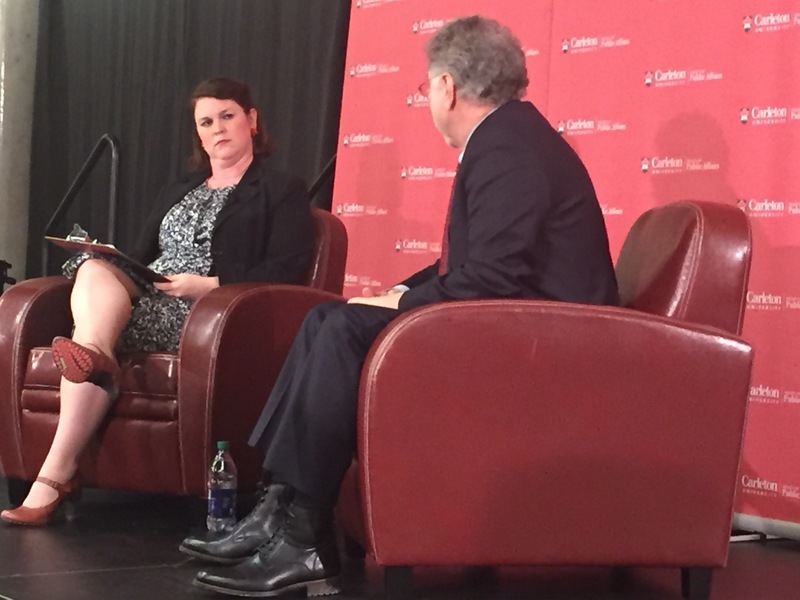 A live blogging event at the 17th Annual Kesterton: Spotlight on Journalism, featuring Martin Baron,the executive editor of The Washington Post, and CBC’s Robyn Bresnahan. 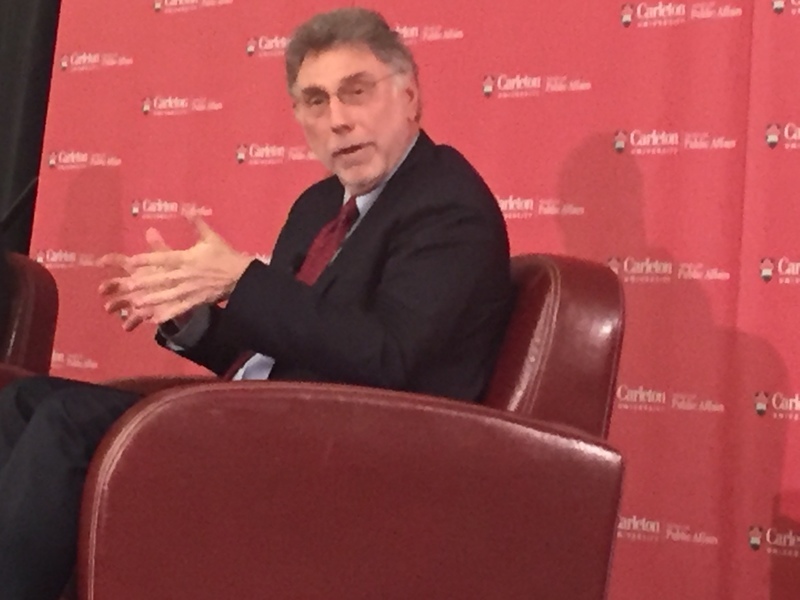 Tonight at Carleton University’s School of Journalism and Communication, Martin Baron, one of the many journalists who inspired the Academy Award nominated film “Spotlight” is here for the 17th Annual Kesterton: Spotlight on Journalism. He’s joins us to have a one-on-one talk with CBC's Robyn Bresnahan to discuss his time as editor at The Boston Globe, his new role at the The Washington Post and the future of journalism in a very special Q&A format. The packed crowd erupts in applause as Martin Baron and Robyn Bresnahan make their way towards the stage. Susan Harada, the associate director of Carleton's School of Journalism and Communication opens the lecture by discussing the history of the Kesterton lecture and brings Allan Thompson to the podium, a faculty member of the school to introduce the guests of honour. A brief clip of the film that focuses on Baron plays. The first question Bresnahan asks is, "What do you think of Liev Schreiber playing you in the film?" Baron says that he was happy with the choice and excited Schreiber took the role. I didn't decide to go after the church, I decided to go after a story. Bresnahan asks if the large Catholic population in Boston impacted his decision to go after the story. Baron says that we're suppose to pursue stories like this as journalists, especially if the implications of a priest molesting up to 80 individuals turned out to be true. Baron says they discussed the possibilities of a negative reaction when the story did come out. Baron says the people who felt the biggest betrayal were the devote parishioners. This continues to be an issue for the church. When the Pope came to the United States a few years ago, he still had to address questions on if the Vatican was doing everything they can. Baron says that despite not facing many repercussions, now that the movie has been released, the Cardinal Law will be held accountable for his actions by the public. Investigative journalism is not ancient history...There is less of it compared to the past...We need to do it, the readers expect it of us. If we don't make powerful individuals accountable, it is the single most irresponsible thing we can do as journalists. Baron believes we need to do our work honourably, because if journalists don't do that, nobody else will. He recounts how he has received emails in the past thanking him for his work. "(Investigative Journalism) should be essential for our soul." Baron speaks on the importance of digital journalism and new media - says it's important not to be nostalgic of the past. I'm not interested in dying gracefully, I'm interested in succeeding. Baron says that the biggest competitors of journalism today is now social media sites such as, Facebook, Google and Twitter. They're huge, they sell ads and have the capacity to target better than anyone. However, they can be used as partners and can be considered as either friends or enemies. The crowd applauses enthusiastically as the one-on-one Q&A comes to a close and the floor is opened for questions. A 4th year journalism student asks if Baron believes if the movie "Spotlight" romanticized journalism and the work journalists do. Baron is asked about the PTSD that followed some journalists during the aftermath of the investigative piece. He says he was unaware of the metal health side-effects of the case until very recently and would have found them treatment had he known. Baron says that getting information is easy to do, but gathering that information is not. He says information is not always freely available. Someone has to gather the information and while it is expensive, we don't always recieve the financial rewards. An audience member asks about the relationship between the editor and a publisher. Baron says he was lucky enough to always have supportive publishers but would never work somewhere where he felt uncomfortable to to do his job as a journalist. Randy Boswell, a journalism professor at Carleton University, asks about Baron's thoughts on the twin revenue sources and the challenges they present, and if the different revenue streams require different kinds of journalism and journalists. Baron says there is no perfect model but the revenue sources will always have to be split by advertisements and subscribers. Baron politely refuses to answer part of a question from a student involving his political opinion on the oncoming American elections. Baron says he thinks there's incredible opportunities opening up for young journalists, but they may not always be in the most typical avenues, such as newspapers. He says to give appreciation to the business be knowledgable of it. Baron says that if investigative journalism is abandoned, the readers will leave the news organization. The Q&A ends as Susan Harada thanks both Bresnahan and Baron and everyone involved for the successful and informative evening.